There is little doubt that the Blockchain technology hype is now being taken very seriously by businesses across many market sectors, as its disruptive potential becomes increasingly evident. 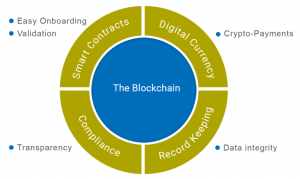 From its beginnings as the public ledger that underpins the Bitcoin cryptocurrency, Blockchain is now being considered for application to all kinds of business processes. Whilst a number of enterprises are already testing the waters by means of targeted PoC’s, many are still grappling with the challenge of separating hype from real potential and devising a realistic game plan. I recently had an opportunity to explore the use of Blockchain for an IoT project that was facing challenges related to trust and data tampering within a multi-party eco-system. I am going to share some insights on this POC where Blockchain offered a new approach to addressing these challenges. 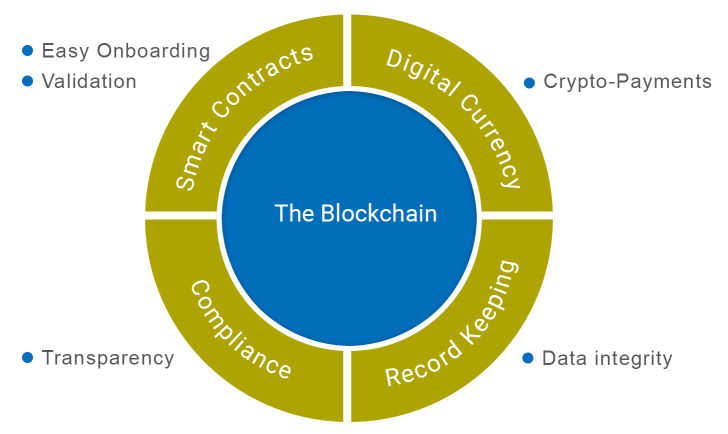 A full overview of Blockchain is covered in our previous blog, but in a nutshell, Blockchain is a public ledger technology where any party in the business network can view, execute and verify transactions. 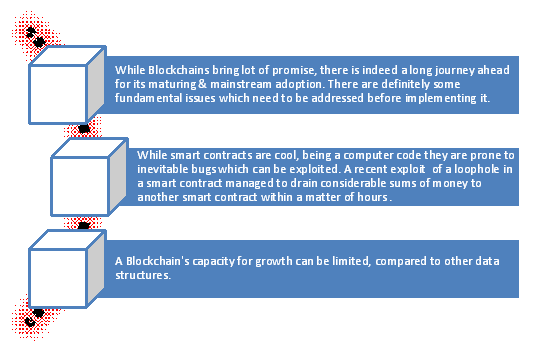 With the functionality of smart contracts in blockchain, business rules agreed by the parties can be embedded and executed as part of the ledgers transactions. These transactions are secured, authenticated and verifiable by all parties within the network regardless of whether or not they hold existing trusted relationships..
Blockchain offers the promise of efficiency without compromising data security & integrity, eliminating the need for intermediaries and reducing the risk of human error with automation. We can already see a rapid expansion of the Internet of Things and a constantly growing need for interoperability and sharing of data and resources. With current centralized models, where all data is sent to a common server, the sharing of data becomes a challenge and can also result in a single point of failure. Consider however, a scenario where an IoT device writes data not to a central database, but to a shared distributed ledger – In some ways this can be seen as a more natural alignment with the generally distributed and interconnected nature of IoT networks. 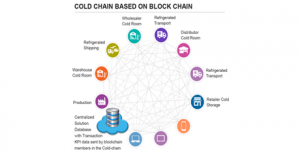 Blockchain in IoT helps create a new flexible and secure IoT network quickly. Each IoT node can be provided an identity by means of a unique address which can be used to send or receive authenticated information or configuration instructions. The resulting mesh network allows computers and other devices to directly connect to one another in a resilient and self-healing manner (dependant on the availability of bandwidth & storage). With blockchain, every IoT node could eventually provide a potential service which can be traded on an open market in real time, with no or minimal fees. Data from IoT devices can potentially be licenced through blockchain to another party, bringing in a totally different service model that is an enabler for multi-sided markets. This use-case faced challenges of authenticity of data, trust, transparency and huge operational costs relating to the on-boarding of new partners, monitoring, enforcement and settlement of payments. 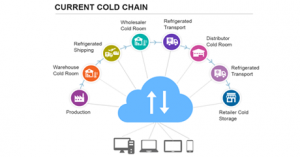 In a Cold-Chain logistics solution, it is critical to ensure that there is optimal cooling at every point in the delivery chain to ensure that the quality of food is maintained till the time it reaches its consumers. As shown in the diagram, from a logistics perspective food items can pass through many different parties on a complex journey moving from production factory to warehouse cold room, then on to a wholesaler’s cold room before it eventually reaches the retailer. It’s a complex eco-system of various independent actors who have to be trusted in the network. It’s always of key importance to know if the temperature didn’t meet the expected values at any point in the journey. This information is important for the food product company as well the various other stakeholders, since there are usually incentive schemes associated with the level of compliance maintained. 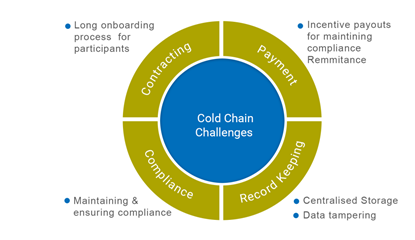 Typically, this is currently implemented using an IOT-Cloud based solution to capture and store all readings, but this approach faces a number of challenges that are depicted in the diagram below, one of the most significant being that of data tampering to hide non-compliance. This contract keeps a check on the temperature for compliance. 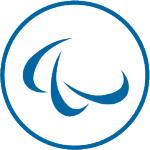 · If a certain temperature is not maintained it raises a violation. · If the temperature is within the compliant range, the node is rewarded in the form of virtual coins. Any authorized blockchain node can periodically check the compliance of a given sensor’s readings.. Any un-authorized deletion or modification of the data can be easily detected as a violation of the blockchain protocol. As highlighted in my previous post on decentralized computing, IOT devices constantly face challenges relating to connectivity, on-board computing power, storage and energy for powering the devices. 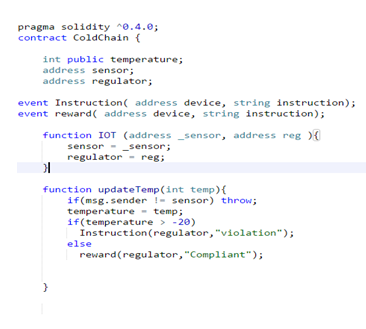 To circumvent some of these challenges, an approach was adopted that extended the functionality of edge computing through an IoT gateway that also acted as a Blockchain node. 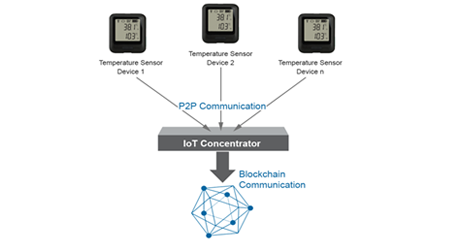 An IoT network gateway device with scalable storage was incorporated to double up as a concentrator enabling aggregation of data from multiple sensor devices with limited storage & connectivity capacities. The solution above can be leveraged to create a system with an inbuilt referential integrity check that ensures authenticity of data. 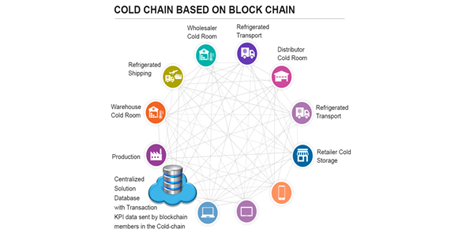 This can give logistics managers & their business customers an accurate & auditable view of KPI data at any point in the cold chain bringing in a much needed transparency in the end to end Cold Chain process. With a blockchain based solution, it is now easy to on-board new logistic suppliers during the peak summer season; in addition monitoring, enforcement and settlement costs drop significantly. chronicled.org which creates an Open Registry for the Internet of Things. It allows product authenticators / customizers and individuals to assign a secure digital identity to a physical object by embedding an encrypted microchip and linking it to a blockchain record. lightning.network chain provides an eco-system capable of handling millions to billions of transactions per second across the network. The hyperledger project allows the creation of a private blockchain. So by the looks of it, it’s not going to be one size fit all, but rather a range of competing and complementary public and private blockchains. Together, these interweaving solutions will form the infrastructure for a new, more efficient and equitable marketplace for everyone.